Today I completed a set of fat book pages for a Vintage Flower Fat Book, from the Altered Art Fat Book Yahoo Group. The flower I chose was Narcissus (aka Daffodil). These pages were created using heavy card stock, 4″ x 8″. I printed an old horticultural drawing of a bouquet then folded the card. On the front of the card, I cut a piece of vinyl smaller than the actual front of the card, I then used my sewing machine to zig-zag stitch the pocket on, leaving the top open. I bought some silk daffodils, took them apart so that all I had were the petals and the center. I placed those into the pocket, added an old book page that I colored orange and cut into the shape of a petal. I also added strappy leaves and circles cut in three shades of green from cardstock and also added some orange seed beads. I stitched the top closed, folded the card in half and glued the sides together to create the 4″ x 4″ Fat Book page. All of this came together to create a pocket that simulates the gathering of pieces of a daffodil. Each card took about an hour and a half to create, but it was well worth the time. Don’t you think? I can’t wait to see the completed book with all of the other artists flowers. This entry was posted in 2008 and tagged collage, sewing. Bookmark the permalink. marci! thank you so much for having this wonderful example! now i get it! LOL i have been trying to figure out this fat book thing and i hadn’t found any examples and explainations of how anyone made a page… i think there is hope for me yet! lol i am also going to do the search like you suggested…. art fat book… thanks again! There are many articles on how to create a Fat Book. Go to your internet browser and use your favorite search tool (google, yahoo, etc.) and look for Art Fat Book. There are also books that you can check out from your local library. Enjoy the journey!! 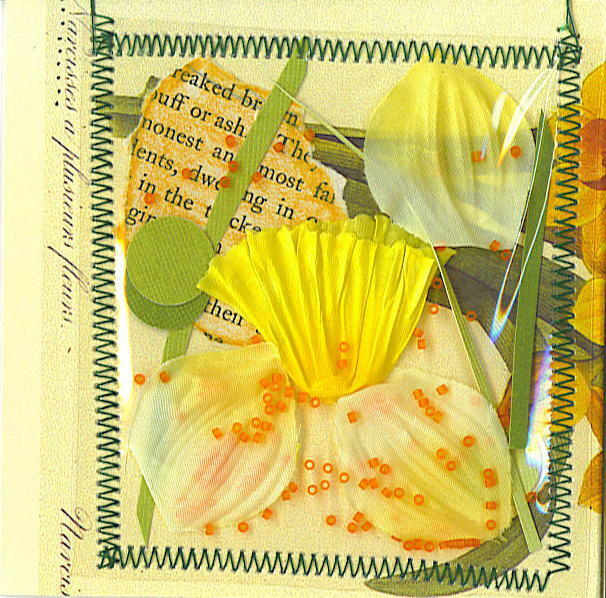 I love the vintage flower fat book. Where can I learn how to make a fat book without joining another on-line group? Marci – this turned out beautiful!